Perhaps the most eagerly anticipated of Sony's seven inaugural Blu-ray releases back in June of 2006, 'The Fifth Element' was expected to be the first of many standard-bearers for Blu-ray. A sci-fi barnstormer packed with plenty of home theater eye candy, the title seemed certain to show off high-def's top-notch video and audio to full effect. Unfortunately, as has now become legend, that didn't happen. 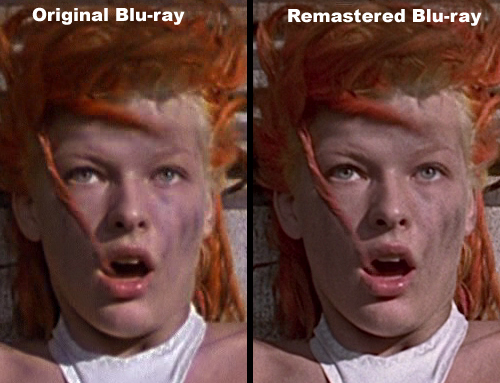 Instead, 'The Fifth Element' on Blu-ray looked little better than upconverted standard-def, and was quickly trounced upon by early adopters and critics alike (myself included). Over time, the title came to represent Blu-ray's less than stellar early days on the market. A year later, the format's fortunes have certainly turned around. Not only has Blu-ray more than redeemed itself with scores of quality high-def releases, but over the course of the first six months of 2007, it has come from behind to beat its high-def rival in overall disc sales by two-to-one. I suppose it's appropriate then, that Sony would choose this moment in time to revisit 'The Fifth Element' as the Blu-ray format's first-ever reissued disc, complete with remastered video, and a brand new Dolby TrueHD audio track. In a most unusual move, the studio is even offering a free disc exchange program to those who felt cheated the first time around. 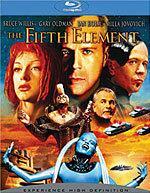 This is a review of Sony's remastered Blu-ray release of 'The Fifth Element,' released on July 17th 2007. This edition replaces the now-discontinued original Blu-ray version, released in June 2006. Some portions of this review not specific to the remaster were previously published in our review of the earlier Blu-ray edition. The images included in this review were screen captured by AVSForum member Xylon, and have been republished here with his permission. For more full-screen screencaps, visit this thread on AVSForum. The plot itself is classic goofy sci-fi, although perhaps the story is besides the point. As 'The Fifth Element' begins, we learn that four stones were taken from Earth in 1914 by a race of giant mechanical turtle-like creatures called the Mondoshawan in order to keep humankind safe from evil. Fast-forward 300 years and as the Mondoshawan are returning to Earth, they are attacked by a group of mercenary dog men, the Mangalores, which leaves our planet defenseless. But out of the wreckage of battle, scientists are able to salvage a claw that they use to regenerate a new "perfect being," called Leeloo (Milla Jovovich). Too bad she escapes from the lab, and crash lands on the hood of cabbie Korben Dallas (Bruce Willis), who is soon thrust into a sort of treasure hunt to save all mankind. To be honest, despite repeated viewings, I've often had absolutely no idea what was going on during a lot of 'The Fifth Element.' Like 'Blade Runner' meets 'Xanadu' meets 'The Apple' (only even more outlandish), this is one loud, colorful, pop tart of a movie. The plot is so crazy and convoluted, that missing 30 seconds of it is the equivalent of missing 30 minutes of another movie. Certainly, many sci-fi fans love this fact -- Besson wisely hints at a larger mythology, which gives the world he creates a life outside of just the visuals. But it also makes it hard to take any of the film all that seriously -- it's all so day-glo-tastic, and the cast is so clearly having such a good time chewing the scenery that ultimately there seems to be little at stake, aside from the ballooning costume budget. Oh, did I mention who else is in this movie? Simultaneously amusing and obnoxious is a pre-'Rush Hour' Chris Tucker, who as DJ Ruby Rhod seems to be channeling Prince and that guy from the 'Mannequin' movies. Then there is Ian Holm as Vito Cornelius, a member of an eternal line of clerics (don't ask). Normally a very serious actor, even Holm looks like he is struggling to keep a straight face during most of the movie. And who can forget Gary Oldman as the freaky arms merchant Zorg? It is saying something that of all the actors here, he might actually be the most restrained, even in the ridiculous get-ups he's asked to wear (all designed by Madonna favorite Jean-Paul Gaultier, of course). As promised, Sony has gone back to the drawing board with the video for this re-issue, and it's clear from the get-go that this is not just another serving of damaged goods. In addition to striking a brand new master, the studio has doubled its pleasure from a BD-25 single-layer disc to a BD-50 dual-layer disc, and has switched from the earlier MPEG-2 encode to a brand new AVC MPEG-4 encode. Since the original Blu-ray release of 'The Fifth Element' has been so resoundingly denounced by both fans and reviewers, there is no need to rub much more salt in the wound. In short, while it wasn't a total disaster, the print was surprisingly dirty, softness was rampant, compression artifacts and noise were frequent, and more often than not, the Blu-ray just looked like poorly upconverted standard-definition. Even at first glance, this re-master is head and shoulders above its predecessor. The source print, the colors, the detail -- this is finally the real high-def deal 'Fifth Element' fans have been waiting for. The most noteworthy improvement is undoubtedly detail and sharpness. The original Blu-ray release looked soft and woefully lacking in fine texture. Though close-ups benefit the most on this new version, the improved clarity of the image is apparent even on medium- and long- shots. Shadow delineation is also boosted, so minor details in clothing, set design and even some of the digital effects that were lost before in the murk are now are much more clearly visible. Depth is also improved -- it is not exponential but certainly noticeable. Lastly, all those dreaded compression problems have been eradicated -- this AVC MPEG-4 encode looks smooth throughout, and artifact-free. After all the bad buzz for the older version, it's interesting to revisit that disc and remember that several aspects of the original edition were actually not all that bad. Doing a fresh compare between old and new, blacks on the original transfer hold up surprising well, and the new version is likewise consistently deep and pure. However, contrast is a bit better with the re-master -- whites seem a bit cleaner yet remain safe from blooming. Colors (which were also quite strong on the original release) appear to be even more robust -- reds, greens and purples in particular are noticeably more vivid and distinct. Some of the inconsistencies in tint have also now been rectified -- gone is the reddish cast, and I was particularly impressed with how much more accurate fleshtones are now, especially for a movie that is so highly stylized. Are there any problems? Sure. The biggest issue is that there is some noticeable edge enhancement applied. It's certainly not the worst I've seen, but in an apparent effort to boost sharpness, some slight halos are clearly visible, and grain can be exacerbated as a result. Is this fatal? Not at all, but it does knock the video down a half-peg. Still, a four-and-a-half star video rating for a ten year-old catalogue title is pretty darn impressive, and should rate as great high-def in anyone's book. Sony is definitely to be commended -- not only for returning to the scene of their past crimes and righting old wrongs, but also for providing this remaster absolutely free to those who purchased the old version. Though Sony has not done the same kind of overhaul on the audio for 'The Fifth Element' as it did with the video, they have thrown in one significant new bonus. This new edition ports over the same very fine PCM 5.1 surround track (48kHz/16-bit/4.6mbps) from the original Blu-ray, but it also includes a new Dolby TrueHD option, which enjoys a slightly boosted encode of 48kHz/20-bit (note that TrueHD is a variable bitrate format, so there is no set bitrate to report). Although it was much maligned for its video, overall I felt that the original Blu-ray edition of 'The Fifth Element' delivered excellent audio in uncompressed form. So for me, the addition of a TrueHD track doesn't offer a particularly significant upgrade. It may be 20-bit versus 16-bit, but that's a small qualitative difference that just doesn't speak volumes here. The mix makes full use of all channels -- and for more than just the odd effect or music cue here or there. The sense of space and imaging to the mix can be quite stunning. Pans from channel to channel are almost transparent, and are just about the same on both TrueHD and PCM. Dynamic range is robust -- especially low bass, which can really deliver a wallop. The ledge sequence with Milla Jovovich's character is a fine example, with the whooshing of vehicles through the air creating an aural delight that both tickles with the clean, distinct highs and provides the subwoofer with plenty of deep vibrations. Dialogue reproduction is also equally fine on both the PCM and the TrueHD -- I never had to ride my volume control at all during the movie, with levels always just right. In short, 'The Fifth Element' produces one heck of an involving and enveloping soundfield, regardless of which audio format you choose. Sony's upgrade of the 'The Fifth Element' on Blu-ray apparently does not extend to the supplements. 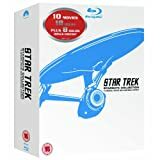 Although the film has enjoyed numerous releases on standard-def DVD, including an "Ultimate Edition" that boasted a number of featurettes, trailers, and other never-before-seen materials, all of that is all gone from this new Blu-ray edition. Instead, as was the case with the previous Blu-ray edition, all we get is a regurgitated Subtitle Fact Track. As is usual with these types of features, this one's a compendium of mostly frivolous trivia, including production notes and cast bios, plus other random tidbits (such as an analysis of how many times the number "five" appears in the movie). Cute, but slight. Watching this remastered version of 'The Fifth Element,' I'm reminded of Richard Attenborough's line from 'Jurassic Park' -- "I don't blame people for their mistakes. I only ask that they pay for them." Sony certainly made some mistakes with their original Blu-ray release of 'The Fifth Element,' but now they are paying for it -- or at least paying it forward. This upgrade truly earns the title. Sure, the supplements still disappoint (and drag down the overall grade), but the video is leaps and bounds better, and the studio has even added on a Dolby TrueHD track. Combine that with a free disc exchange program, and one must give Sony props for getting it right this time. Perhaps one day we'll get a new version with extras, but in the meantime, if you just want great next-gen video and audio, at last 'Fifth Element' delivers on the bottom line.